Chai Tots' academic approach is based on an Integrated Montessori Curriculum. The bulk of the curriculum is comprised of the traditional Montessori areas of study, however we have added to this by incorporating Jewish traditions, Hebrew language, group activities and cooperative play. Both languages are available for the child to learn (based on their level and desire). We gather together at circle time to greet all our classmates. Our goal is to become a school family as we “check in” with one another. We begin early math readiness skills through our discussions about the day, month and year during calendar time. The children are assigned a day each week for the entire school year. They are encouraged to bring an item from home or something special they have made to share with the class. The teacher or students will ask questions about their selection. It is through show and tell that children acquire expanded language skills and the class, as a whole, gains valuable listening skills as well. Your child will also begin to build self-confidence and self-esteem as they share their unique selections. Play is a vehicle of growth for the young child. During free play, children learn to interact with each other and play cooperatively. Playtime affords a child the opportunity to share, think and to problem solve. Play is hard work for the 3, 4 and 5 year olds. A variety of toys in the classroom encourages children to use their wonderful imaginations and build upon their creative, dramatic play while developing their gross and fine motor skills. Our students participate in outdoor and indoor activities. Children are provided constant opportunities to develop their gross and fine motor skills, to develop finger strength and dexterity, and hand-eye and body coordination. Several of the games we play involve working as a team. We use scooters, balls, t-ball stands, field hockey sticks and a variety of relay races to facilitate these goals. Our Montessori class also participates in movement classes that are designed to augment the physical education program. The children learn rhythm, dance, stretching and aerobics. Music is the universal language in our classrooms! Our classrooms are equipped with musical instruments and opportunities for children to explore rhythm and song. The Early Childhood music selection includes CDs of popular children’s songs, classical music, modern pop, show tunes, instrumental, Hebrew and holiday music. The children often participate in a parade using rhythm instruments as we march through the hallways, community hall, gym and throughout our school! Your child will learn several songs during the course of the year and participate on stage. The children will have an opportunity to explore their creativity using a variety of art media. Paints (including tempera, watercolors and biocolors), markers, crayons, colored pencils, tape, glue, scissors, glitter and felt are a few of the myriad of materials the children will experiment with in the classroom. It is important to remember that it is the process not the finished product that matters! We want your child to feel proud of their creations! Preparing and celebrating Shabbat is a special time for our children. They welcome Shabbat by singing the blessings over the candles, reciting the Kiddush-blessing over the wine (grape juice) and singing the Motzee-prayer for eating bread over the Challah. Every child will have an opportunity to be a Shabbat host/hostess and bring a Kosher treat for the entire class. All classrooms are equipped with iPads loaded with age-appropriate educational software for learning and exploration during choice time. Technology is not taught in isolation but rather as incorporated activities within the classroom. Students learn to follow directions, match objects and are introduced to beginning reading and math readiness skills. In school, the students watch how seeds grow and roots form, and then write and illustrate their own books charting their growth. The students learn to name the parts of plants, flowers, and leaves and particularly enjoy learning about the classification and habitats of a myriad of animals. They learn to make predictions and organize their thoughts by doing fun experiments involving freezing water and melting ice, figuring out what floats and what sinks, and much more. Our exciting science-related field trips include visits to museums, farms and apple picking. Art and music are a part of every day at Chai Tots. Our classes are regularly filled with the sound of singing and the children take pride in the many creative art projects they produce. Our art corner is a favorite area for our budding artists and students often enjoy working on tasks over a few days. Every week our Preschool students create art projects related to the Parshah of the week and learn to appreciate the stories of the Torah in the fun and hands-on way. Creativity abounds during our holiday celebrations where students perform dramatic skits, sing songs, and have a chance to show off the props and costumes they had a hand in making. Rhythm and music feature strongly in our Preschool program and are a continued focus in all our classes. Families will be invited to help share in our celebrations throughout the year, including birthdays. A special birthday circle time and activity is planned for each child and the birthday child’s parents are invited to join us. The whole class will prepare the food to be served at the birthday. If you would like to bring snacks to school for your child’s birthday celebration, please contact Rochel Kalmanson to find out where kosher snacks/products with reliable kosher certification can be purchased in Mason. If you would like to donate a book or work to the classroom in honor of this special day please contact us. A sticker with your child’s name will be placed in each donated book. A small frame will be placed next to each donated work saying by whom and for what it was donated. In accordance with the Montessori Method, all classes at Chai Tots have a mixed age group: from ages 1.5-2 in the Toddler, and ages 3-6 in the Preschool. This natural mixture of ages allows the younger students to look up to the older students as role models and in turn helps the older students build confidence and self-esteem as they assume their roles as leaders in the class. The Toddler and Preschool classrooms are divided into subject areas and each area contains material of various degrees of complexity. In a Montessori class students are able to progress at their own pace allowing children at different developmental stages to thrive within the same learning environment. In all of our classes we also incorporate non-Montessori elements including group learning (such as circle time in the younger years and teacher-directed group presentations or discussions in the older years), communal eating, and dramatic play. Our curriculum is tailored to the needs of each child and helps foster students who are active, engaged learners. 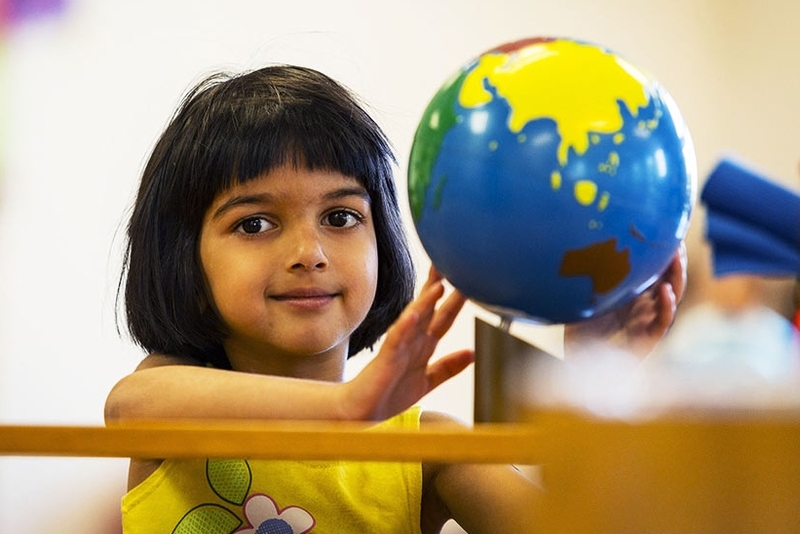 To learn more about the Montessori Method, visit the Association Montessori International UK website or the North American Montessori Teachers' Association Website. Planning for the classroom involves consideration to the age appropriateness for the group and individual aptness for each child. Being cognizant that every child learns differently, we use various mediums to teach each lesson. Children's interests are explored through inquiry and research methods. Assessment is also as important part of the curriculum. A portfolio for each child contains developmental checklists, work samples and anecdotal records. We endeavor to make sure that children reach their individual potential. We integrate an emergent curriculum approach into a thematic approach to create a synthesis of programs including the best guided and individualized educational opportunities. We encourage the children to develop self-motivation, active investigational skills through questioning, exploring and observing, and the thinking and problem solving abilities needed to thrive in a world of challenge and competition. Children are surrounded with books, literacy experiences and exposure to the alphabet to prepare them for pre-reading and the reading that follows. We encourage each child to work and play with others, to develop language communication skills, to respect the rights and privacy of their peers and most of all to develop feelings of kindness, courtesy, helpfulness and acceptance. Children are provided constant opportunities to develop their gross and fine motor skills, to develop finger strength and dexterity, and arm-eye and body coordination. Children are encouraged to develop personal responsibility, a positive self-concept, and understand the difference between right and wrong. They are encouraged to recognize that people are different and to be accepting of others and we help them learn and practice appropriate ways to respond to others and to express their feelings constructively. Lesson plans at The Chai Tots Early Childhood Center are built around the events influencing the children at the time that they are being taught. Weather changes, special animal habits, national celebrations and holiday seasons all determine what will be brought into the classroom at any particular time of year. All these are laced into the general curriculum to allow the children to learn from what is going on around them. During the season of Rosh Hashanah, the Jewish new year, when it is traditional to dip apples into honey and blow the shofar (a ram's horn), we take the opportunity to make the holiday a scientific experience! The children learn all about apples, honeybees and how they make honey and about the different kinds of animals with antlers. During Chanukah, when it is traditional to light a Menorah in the home, the children learn about fire safety, firefighters and how they help our communities. This is the pattern that follows our curriculum throughout the year and provides the children with experiences that give them pride in their tradition!